Another 4 wins & 17 nominations. 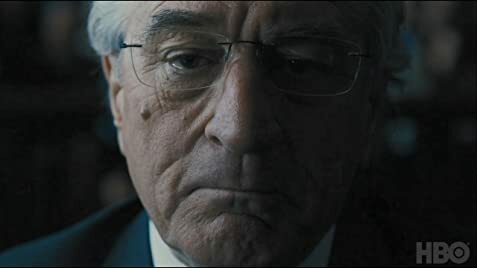 I wanted more, more of how Bernie Madoff became the man we meet in this film. When we meet him he is already rotten. He is mere months away from his arrest. There is in Robert DiNiro's portrayal title or nothing to like or empathize with. Or care about. What we have is a true sociopath who is found out early in the film, which forces us to see nothing but the devastation left in his wake. This is my way of saying there is no story arc. There are no surprises. What flashbacks there are show Madoff in his personal life but always at his worst. Michelle Pheiffer as Madoff's wife has a small rand unconvincing role. And like her husband, I couldn't care less about her fate. As for the Madoff sons, to some degree this is more their story than anyone else's. And to the degree that I learned quite a bit about them, the film deserves credit. But that is not enough. Pulitzer Prize-winning New York Times reporter Diana Henriques was the first to interview Bernie Madoff on August 24, 2010, after his incarceration on June 29, 2009. She plays herself in various scenes throughout this movie interviewing Madoff (Robert De Niro), and has said that the resemblance was so uncanny, she got goosebumps just sitting opposite him. Mark Madoff: How could you do this? Bernie Madoff: It got bigger and bigger and i just wouldn't stop it. In a montage in which Bernie is calling Ruth from prison, he leaves her multiple voicemail messages. This is technically impossible to do, as all phone calls placed from federal penitentiaries must be accepted by the person the prisoner is calling. This is to prevent people from receiving unwanted phone calls and voicemail messages from prisoners. The entire premise of the montage is unrealistic. If prisoners could call whomever they want whenever they want, all kinds of people would receive unwanted and threatening messages, including victims of the prisoners' crimes.